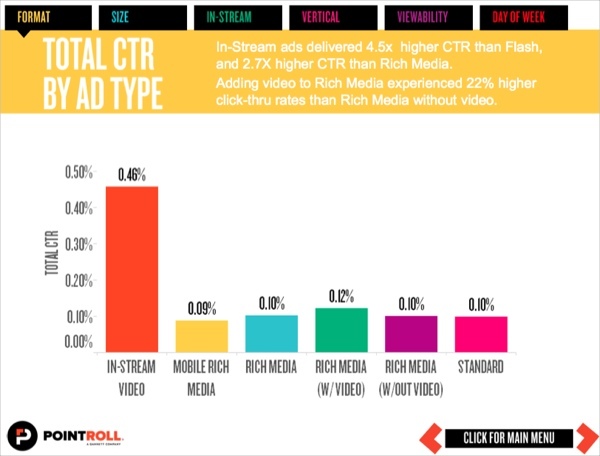 PointRoll's 2013 Benchmarks report finds, among other things, that in-stream video ads achieved a .46% click-through rate, 4.5x higher than the CTR of Flash ads. In-stream video ads also had a 75.3% completion rate, far better than rich media with video (31.7%) and mobile rich media (25.2%). Conversely, rich media with video had a 2.2% interaction rate compared to 1.3% for in-stream video (interaction rate defined as percentage of interacted ad impressions). 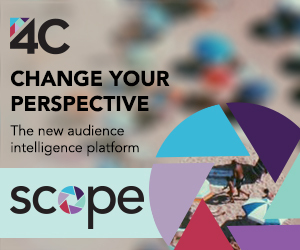 30-second ads deliver 55% more clicks than 15-second videos. In-stream completion rates increased 10% vs. 2012 and CTRs have increased 18%. The best-performing vertical for in-stream CTR was Finance, with .63%, followed by Food & Beverage with .5%. Travel and tourism had the best interaction rate, at 1.9%, followed by Food & Beverage with 1.8%. The benchmark report is available for download here.